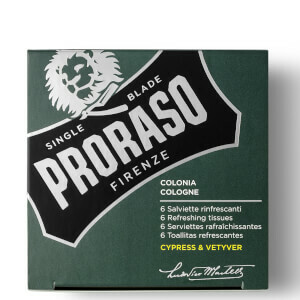 Instantly invigorate the skin with Proraso Refreshing Tissues in Cypress and Vetyver. Helping to cool and calm the complexion, the cologne wipes use notes of Bergamot, Amber and Cedar to delicately infuse the skin and uplift the senses. Simply dab the beard or face for instant refreshment. 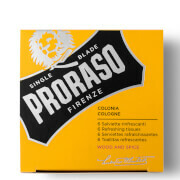 Free from parabens, phthalates, silicones, mineral oil and SLS. Cruelty-free. Unwrap a tissue and refresh the skin. Alcohol Denat., Aqua (Water/Eau), Parfum (Fragrance), Sodium Benzotriazolyl, Butylphenol Sulfonate, Tris (Tetramethylhydroxypiperidinol) Citrate, Tributyl Citrate, Buteth-3, Tetrasodium Glutamate Diacetate, Citral, Limonene, Linalool.